In its January report, the World Gold Council said it expects increased market uncertainty, expansion of protectionist policies, and the Fed's more neutral monetary policy stance to make gold increasingly attractive to investors as an effective portfolio diversifier and hedge against systemic risk. In late February, spot gold surged past the US$1,346/oz level to a 10M high, buoyed by uncertainty over the outlook for global economic growth and trade. Bullion prices have since pulled back, ending the March quarter at US$1,292.38/oz, up 0.8% since the start of the year. SGX offers investors opportunities to participate in the gold sector through 3 mining stocks – CNMC Goldmine, Wilton Resources and Anchor Resources – and the SPDR Gold Shares ETF. For 1Q 2019, the ETF generated a 4.6% and 4.8% YoY increase in volume and turnover respectively. Volume and turnover for the ETF also nearly doubled in March from the previous month. SGX offers investors opportunities to participate in the gold sector through 3 mining stocks – CNMC Goldmine, Wilton Resources and Anchor Resources – and the SPDR Gold Shares ETF. The World Gold Council (WGC) has consistently flagged the diversification role of gold, noting that bullion is a classic haven asset. It has suggested that when investors add risky assets to their portfolios, gold should make up 2%-10% of the portfolio, and more specifically, for portfolios that comprise 60% equities and 40% debt, a 5%-6% allocation to gold is recommended. This is because the metal has a history of maintaining low correlations to most other asset classes, and including assets with a low correlation to each other helps reduce overall portfolio risk. In a report published in January 2019, the World Gold Council said it expects increased market uncertainty and the expansion of protectionist economic policies to make gold increasingly attractive as a hedge. While gold may face headwinds from higher interest rates and US dollar strength, these effects are expected to be limited after the US Federal Reserve signalled a more neutral monetary policy stance. Structural economic reforms in key gold markets will also continue to support demand for gold in jewellery, technology and as means of savings, it added. “We believe that in 2019, global investors will continue to favour gold as an effective diversifier and hedge against systemic risk,” it noted, adding that levels of risk and uncertainty are increasing. It cited expensive equity valuations, higher global market volatility, political and economic instability in Europe, and the increased likelihood of a global recession as factors. 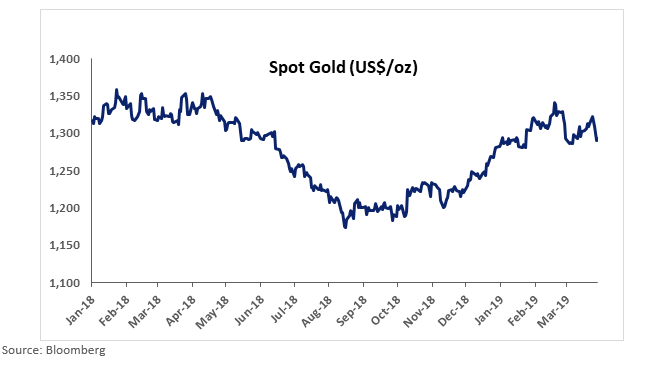 In late February, spot gold surged past the US$1,346/oz level to a 10-month high, buoyed by uncertainty over the outlook for global economic growth and trade, equity market volatility, as well as signs of a slower rate hike cycle by the Fed. Lower rates boost the appeal of bullion as it is a non-interest-bearing asset. In recent weeks, investor appetite for riskier assets have returned, causing gold to retreat below the US$1,300/oz mark. It closed at US$1,292.38/oz on 29 March 2019, gaining 0.8% since the start of the year. 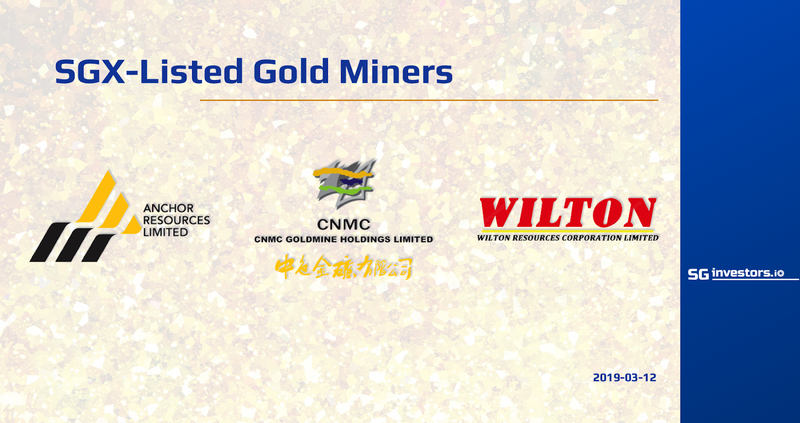 SGX’s 3 gold mining plays – CNMC Goldmine, Wilton Resources and Anchor Resources – are in different stages of the gold exploration, development and production cycle. The trio, with a combined market capitalisation of about S$180 million, have averaged a total return of -12.7% in the first three months of 2019. This is an improvement over average total returns of -31.9% over the last 12 months. While gold stocks have a high correlation to physical gold, they are typically considered leveraged plays on the metal. In addition to bullion prices, there are also many other factors – such as corporate activity, currency, gold discovery, earnings power, operating efficiencies – that impact the price of gold stocks. Mining companies may also often take up to 10 years or longer to develop their mining projects and bring them to production. While there are no upstream gold mining activities in Singapore, the city-state is home to downstream international gold refineries and bullion product manufacturing plants, with significant storage capacity through Singapore Freeport. The table below details the three gold mining plays, sorted by market capitalisation. SPDR® Gold Shares ETF offers an innovative, relatively cost-efficient and secure way to access the gold market. The exchange traded fund (ETF) aims to lower many barriers that prevent some investors from investing in bullion, including the logistics of buying, storing and insuring the commodity. In addition, certain pension funds and mutual funds do not or cannot hold physical commodities or the derivatives. The ETF is set up to reflect the performance of bullion, less the fund’s expenses. It tracks the London Bullion Market Association PM Gold Price, and the physical bullion is kept in the form of London Good Delivery bars. For the first three months of 2019, SPDR® Gold Shares ETF saw a year-on-year rise in investor participation – it generated an increase of 4.6% and 4.8% in volume traded and turnover respectively from the year-ago quarter. In March, volume and turnover for the ETF also nearly doubled from the previous month. The tables below detail the volume and trading turnover for SPDR® Gold Shares ETF for the months of January to March 2019 and 1Q 2019. SPDR® Gold Shares is designated as a non-Specified Investment Product, and is thus an Excluded Investment Product (EIP), accessible to anyone without pre-qualification. Investors should refer to the fund prospectus for more information, including product risks. ETFs are investment funds listed and traded intraday on a stock exchange. The majority aim to track the performance of an index and provide access to a wide variety of markets and asset classes, including local stocks, international securities, bonds, commodities or money markets. Each ETF gives investors access to the performance of the asset that comprises the underlying index. Investing in the ETF is also less costly if one was to build a similar portfolio by buying the individual stocks. It also provides exposure to international markets and asset classes that may be inaccessible to individual investors.